UPDATE: Great news! Just as we posted this, we learned that Bala’s sculpture will remain in the courtyard for an extended stay until April 2012. The inside portion of his installation will still come down this weekend. Before Bala’s sculpture bids us farewell this weekend, come and see it on a sunny day. If you stand in the stairwell between the second and third floor of the museum, you’ll be able to see the amazing shadows the bicycle spokes cast on the slate pavers of the courtyard. I think they look like a line drawing! This entry was posted in Intersections and tagged A. Balasubramaniam, Bala, Courtyard, Intersections, sculpture. Bookmark the permalink. Good news! 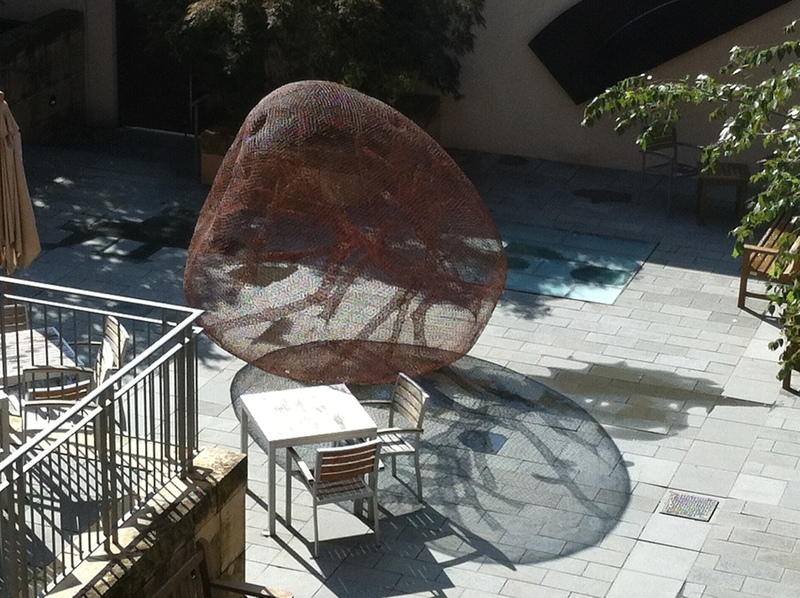 The Bala sculpture in the courtyard will enjoy an extended stay into April 2012. We will get the unexpected pleasure of seeing it under winter and spring conditions.